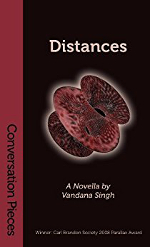 This novella has a really original and fascinating premise, in which mathematics can be explored in a quasi-physical state. The universe it builds is one I'd love to revisit, but this story stands on its own and feels complete. The theme about leaving home and whether you can ever really return is explored in a thought-provoking but not heavy-handed way. But the real strength of this novella is the writing, which pulls you along through the story and the necessary world-building detours so expertly that it feels like a leisurely read, and yet I couldn't put it down. In short, this is a great sci-fi novella that I thoroughly enjoyed reading.